The bed that John Marion Pickard Jr. was born in still remains in the corner of the room from where he first saw the light of day on June 25, 1913. His home place, built in 1829 in the Rutherford community of Lascassas, like the bed, still belongs in the family and is the abode of his son, John M. Pickard III. A handsome man with a strong voice, Pickard would leave the family farm in the early 1940s for New York City, serve in the U.S. Navy during WWII and eventually wind up in Hollywood where he filled the boots of cowpokes in dozens of western movies and TV series. This week’s release of True Grit, a retelling of the 1969 film that earned John Wayne his Oscar, stars Jeff Bridges in Wayne’s old role as Marshal Rooster Cogburn. The movie also revives reflections of Pickard, who appeared in the first few minutes of the ’69 western before his character, Frank Ross, was murdered, setting off the chain of events that leads a teenage girl to track down the killer of her father. Pickard’s son, John, and granddaughter, Dana McSpadden, shared a few memories last week about their family’s Hollywood connection and showed several mementos from Pickard’s career in the Big Apple and on the big and small screens. Above a fireplace in the front bedroom of the house, which was built by John Pickard III’s great-great-grandfather, Samuel Read Rucker, sits a handsome, silver loving cup inscribed: Presented by Major Bowles to John Pickard, Winner Paramount-W.L.A.C. amateur contest, Sept. 2, 1935. This black-and-white publicity photo from 1969’s True Grit shows John Pickard as the father of Kim Darby’s character, Mattie Ross. He has just been murdered, which sets his daughter on a trail for justice. About four years later, the talented and lucky Pickard won $400, which proved his ticket to New York City. “He won the money during bank night at a movie theater and with it went to New York and hooked up and got into plays,” said his son, who has been in the building material business since 1977 and operates J&M Supply on Highway 231 just north of the Stones River bridge in Walter Hill. As a model Pickard appeared in a 1942 war bond poster and also served as Christopher Columbus in a large, colorful illustration that celebrated the 450th anniversary of the explorer’s discovery of America. A framed copy of that “Liberty Lives On” poster, painted by Howard Chandler Christie, dominates a place above the mantel in the bedroom beside the loving cup. From 1943 to 1946 Pickard served in the Navy spending much of his time on Guam in the South Pacific where he performed in USO shows. After the war, “He went to California and got his first little part in The Wake of the Red Witch,” recalled John of his father’s debut movie appearance in 1948 as a diver in a John Wayne sea adventure. advent of television, he found more work before the cameras in the early 1950s in cop and detective series, such as Boston Blackie and Racket Squad, and by the mid-1950s he was popping up in a variety of shows from Hopalong Cassidy to Dragnet to My Friend Flicka. His biggest shot at stardom came in the 1957-1959 syndicated western series, Boots and Saddles, as he played the lead role of Capt. Shank Adams, a part he knew well as he had portrayed plenty of cavalrymen over the years. 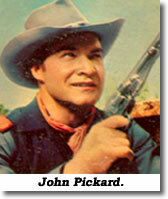 Working with Pickard in the first 13 episode s of this series was actor-singer-songwriter Johnny Western. 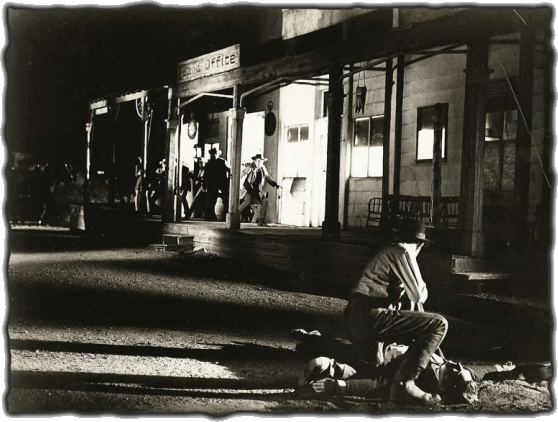 Western wrote the theme to TV’s Have Gun—Will Travel and is the voice viewers hear singing the song during the show’s closing credits. “We did Boots and Saddles together on location in Kanab, Utah. It was the story of the 5th cavalry,” said Western last week over the phone from his home in Mesa, Ariz. “John was a real Southern gentleman. I always thought that if you closed your eyes and heard him speak on the screen, he sounded a lot like Randolph Scott. He was a very physical guy who kept in great shape and was fun to work with. He was darn good in the saddle and very good with the guns. “I never heard a harsh word from him. He always seemed to have everything under control, never a down side. I really liked to be around John. He was a good friend,” said Western. While Pickard was to be a guest in about a dozen episodes of TV’s longest-running western, Gunsmoke, ironically, he may never realized how close he came to getting the main role. “He liked working on Gunsmoke, and he liked Sheb Wooley (of Rawhide). He liked to work with Wayne,” said John. Before his career was finished, Pickard made three John Wayne films: Wake of Red Witch, Chisum and True Grit. Through the 1960s, ’70s and ’80s, he was a guest on such TV shows as Lassie, Perry Mason, Ben Casey, Tarzan, Ironside, The Twilight Zone, Mission: Impossible, Mannix, Kojak, Time Tunnel, Little House on the Prairie and Cannon, and made his final TV appearance on an episode of Simon & Simon in 1987. Tragically, he died Aug. 4, 1993, at 80 in an accident on the farm where he was born. “He was here when he got killed in a lot by a bull,” said his son. The actor is buried not far from the house in a family cemetery. “I saw all of his other movies but I really liked True Grit,” said John. Will he go see the new version? “I don’t know. I might,” grins John at the thought. “We thought he was a big man, and when he got into these movies with other people he wasn’t that big,” said John of his 6-foot-tall father, who worked in just about every western TV series there was but never latched onto that one big role that could have made him a household name. “When you look at pictures of him as a young man, he was a handsome man. He had a distinctive voice. We could be in the other room and hear his voice and know it was him, but you better come quickly because he’d be gone,” said Dana of Rutherford County’s thespian contribution to the Golden Age of Television.